Information about the H.W. McCandless company is presented in a new article that has been added to the website. McCandless secured a place in history by manufacturing Audion vacuum tubes for Lee DeForest. While that subject is well documented elsewhere, the subject of this article will focus on Henry McCandless himself and his miniature lamp business. 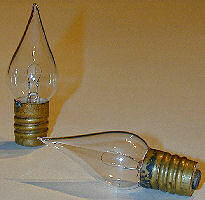 Five early British Lane-Fox incandescent lamps have been added to the collection and are documented on this page. Also presented on this page are excerpts taken from electric lighting books and electrical journals from the time period these lamps were made that discuss the Lane-Fox incandescent lamp in detail.